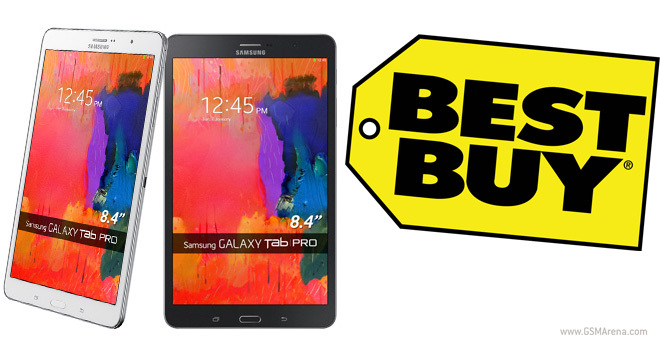 Best Buy in the USA is having a sale on the Galaxy Tab Pro tablets, each is $100 off. The most affordable model is the 8.4″ version, which currently goes for $200. That’s for the 16GB Wi-Fi version. The same model goes for $255 on Amazon.com. Anyway, the Galaxy Tab Pro 8.4 normally goes for $300. If the name sounds unfamiliar, it’s an 8.4″ tablet with a 2,560 x 1,600px screen (Super Clear LCD) that is powered by a Snapdragon 800 chipset. One potential downside is that it’s still on 4.4 KitKat. There’s the 10.1″ model (also 16GB Wi-Fi) for $300 ($100 off) and the top of the line 12.2″ model (32GB Wi-Fi) for $550 ($100 off, again). These two switch to an Exynos 5420 Octa chipset, but haven’t moved off KitKat either.